Into the gilded pantheon of bright escapist office pop songs – see Dolly Parton's '9 to 5', and the Bangles' 'Manic Monday' – we can warmly welcome 'Whiplash', from Glasgow R&B livewires Bossy Love. The title track of their debut EP is a day-glo revelation – hand-claps, playground chants and all – and it's a far cry from the London day-job around which Amandah Wilkinson navigated the record's inception. 'I top-lined the majority of the Whiplash EP at my desk while pretending to order stationery, even sneaking away to record the melodies on my phone,' she says. The vocalist and songwriter moved to Glasgow soon thereafter, to be closer to her friend and collaborator John Baillie Jr (drums, songwriting, production). 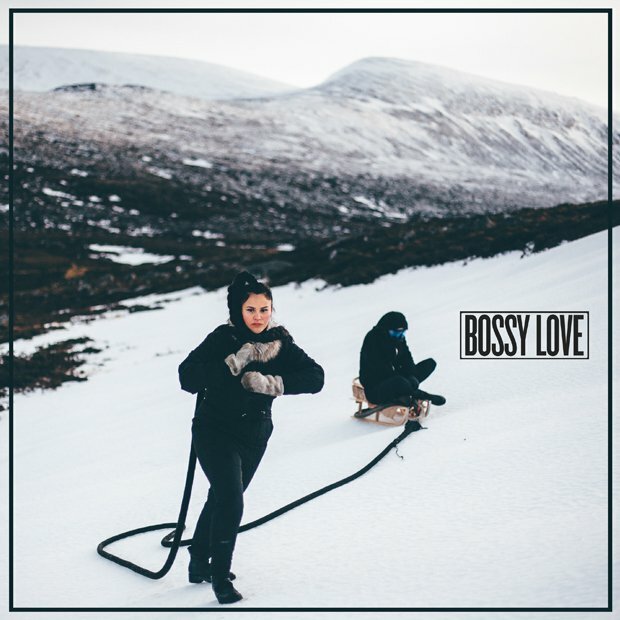 Bossy Love have since slain fans with their pop-fired electro and lush R&B, on singles like 'Call Me Up', 'Sweat It Out', 'Want Some' and 'Body', and particularly live where they're a blaze of euphoria, as evinced on festival stages throughout the land, and supporting Kelis, Metronomy and more. The new EP continues to shed light on – and delve into – the thrilling musical chemistry between Wilkinson and Baillie Jr, and reminds us that we're lucky the former packed in her desk-bound London job and jumped on a Megabus north of the border. While the title track is a joy, it's far from the only highlight on the Whiplash EP. Lead single 'Up All Over Me' (they do have a vivid way with a song title) is a dark, atmospheric synth-pop lullaby. They're a band fizzing with sounds and ideas, but they've also got a way with space (and sonic depths), as further explored on downtime tech-serenade 'No Control'. 'Don't ignore this love, I know you wanna take it,' sings Wilkinson. You bet we do.